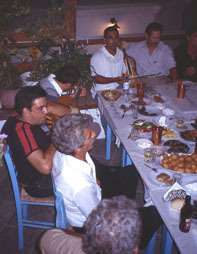 an all-inclusive holiday are either clients of the British Laskarina travel agency (who can’t really be seen as a crowd, except from the reception meeting, where a gentleman looking like a British Army corporal instructs his compatriots about the very few island’s snakes, ‘totally harmless’), or of the Italian Tilos Mare residence. 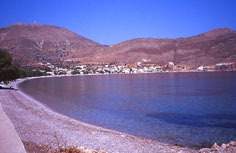 The Tilos Mare ‘tribe’ can be seen as a paradigm of Tilos’ uncommon tourist development. The beach in the bay of Livadia is about three km long, with tamarisks growing in the back. During a normal summer day, you will see a few tourists (about three or four) in the shade of each of the tamarisks, regularly spaced. But there is just one spot, about fifty meters long, where the population density becomes much higher, ghetto blasters play dance music, and muscled animateurs entertain a crowd that seems to have passed exams for a Berlusconi TV reality show. That’s Tilos Mare. Sometimes they are taken by boat to some of the remote beaches, where they find other tourists (Greek, Italian, British, French, German, Dutch, and recently also from Spain and Israel) who arrived there by foot, and they are surprised and a bit disappointed. 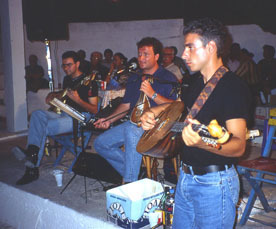 None of them is usually seen at the island’s many musical events. 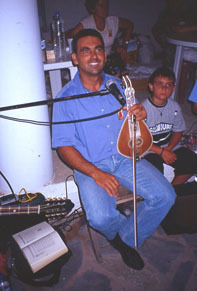 This is true, in general, for most foreign tourists, for the opposite but converging reasons that ‘Greek music can only be understood by Greeks’, and that ‘the only real traditional music of Greece is sirtaki, and we know it already’. 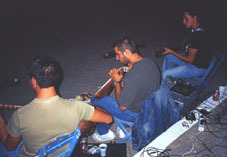 However, concerts and festivals are usually very crowded, the audience (and/or dancers) being formed by locals, Tilians that live in Rhodes or Athens, Greek tourists (students camping on Eristos beach), expatriates, and a few foreigners. 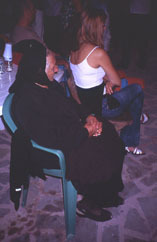 Every summer in Tilos there is a number of religious festivals: on July 25th to 27th at the monastery of Agios Pandele�monas, an ancient but perfectly functioning monastery from the Middle Ages (there are no monks living there: just rooms for occasional pilgrims), located high on a cliff in the most Northern part of the island; on July 28th in Megalo Chori�, in the small square near the church; on August 14th in the little church in Mikr� Chori�; on August 22nd in the sanctuary of the Holy Virgin (Panagh�a Pol�tissa) on the hills SE of Livadia, and - in apparent competition - in the small monastery of Kamarian�, near the village of Agios Andonis; on August 23rd again in Megalo Hori�. Music has obviously a great social significance in these events. 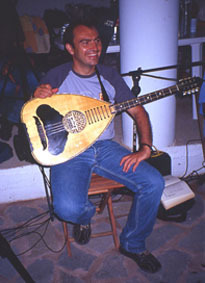 First, it is a matter of pride for the organising committees that the best musicians be invited (with perceivable competition amongst the festivals and related communities): most of the times, musicians come from islands in the Southern Dodecanese or Crete. 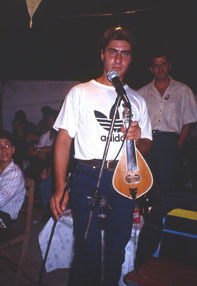 I have recordings from a group from Kassos and a few groups from Crete: one of them (for Agios Pandeleimonas festival in 1997) arrived by ferry escorted by an ‘official’ Mercedes with banners, with a hero of Cretan resistance (in traditional costume) who led the dances along with the island’s mayor, adding the sound of his Beretta pistol to the lyra, laouto and doubeleki of the greatly competent music trio. proper hierarchy is respected. Kids learn to be last in the line, and sometimes bands dedicate ‘easy’ dances to the children. 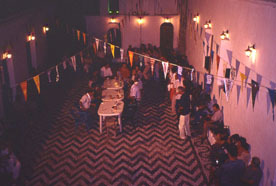 Festivals usually last a whole night, from sunset to dawn; families sit around tables, and food (souvlaki or katziki) is provided, sometimes for free. Expatriates have their chance, here, to show their wealth and generosity by making offers to the local church or monastery or tipping the musicians. 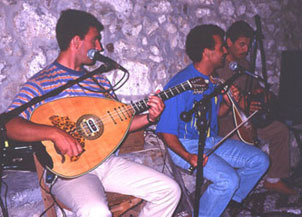 Bands are usually trios, with cretan lyra, laouto, doubeleki or electric bass, the band leader being the lyra player and singer. 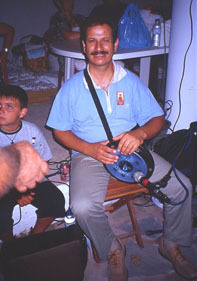 But I saw interesting variants, like a keyboard-based one-man-band, or a ‘traditional’ trio (From Halki) accompanied by a rhythm box (very well programmed). 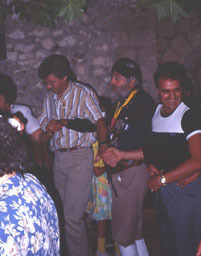 Group from Halki at Panag�a Pol�tissa festival, 2003. The black box on the mixer is a rhythm box.